JERUSALEM (CNN) -- Former U.S. Rep. Cynthia McKinney -- who was aboard a ship the Israeli navy intercepted this week -- is in a detention center and will be returned to the United States, the U.S. Embassy said. 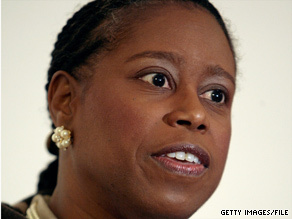 Former U.S. Rep. Cynthia McKinney, D-Georgia, refuses to sign Israeli deportation papers, the U.S. Embassy says. McKinney was among those on a ship that the Israeli Defense Forces said violated an Israeli blockade and crossed into Gazan waters on Tuesday. The Israeli navy gained control of the ship and took McKinney and about 20 people into custody, said the Free Gaza Movement, a human rights group that sent the ship. The group said the ship, which it calls Spirit of Humanity, was carrying humanitarian aid to Gaza. McKinney served six terms in the House of Representatives as a Democrat from Georgia and was the Green Party's 2008 presidential nominee. The ex-lawmaker is in the Givon immigration detention center in the central Israeli city of Ramle, the U.S. Embassy said. She has been given deportation papers but has refused to sign them, the embassy said. She will be held for three more days, assuming she does not sign the papers, and then will be sent back to the United States, the embassy added. The location of others taken into custody was not immediately known. The IDF said the ship, which it called the Arion, had been warned while at sea that it would not be allowed to enter Gazan waters "because of security risks in the area and the existing naval blockade." The IDF said the cargo boat disregarded all warnings and entered Gazan coastal waters. An Israeli navy force intercepted, boarded and took control of the vessel, directing it toward Ashdod, Israel, the IDF said. The boat's crew would "be handed over to the proper authorities," the military said. Without naming who was on the boat, the IDF confirmed that the incident was the same detailed by the Free Gaza Movement. According to the Free Gaza group, McKinney said, "This is an outrageous violation of international law against us. Our boat was not in Israeli waters, and we were on a human rights mission to the Gaza Strip" before authorities confiscated cell phones. Also aboard was Mairead Maguire, who co-founded a group that worked for peace in Northern Ireland. Maguire and co-founder Betty Williams received the Nobel Peace Prize in 1976 for their work. Free Gaza said the voyage is the eighth such trip the group has launched. Five succeeded, the group said, but the Israeli military stopped attempts in January 2008 and December.